Strain will be made of a combination of laminated wood, trace steel wire, sound amplification system and Dickensian Steam-punk inspired precision driver mechanisms. 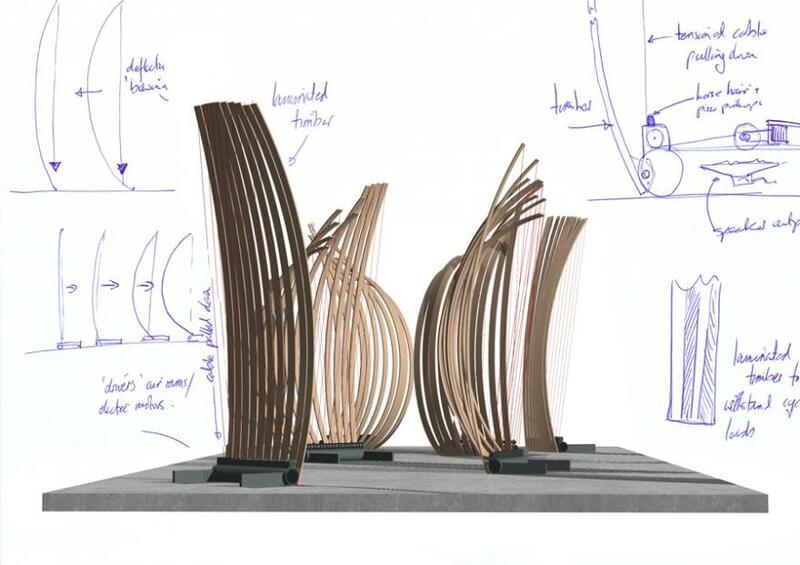 Realized to a highly polished aesthetic finish, Strain will consist of five sets of seven elegant bow-like elements, each standing 2.4m tall. These elements will travel through degrees of tension, via a protracted process of the ‘winding down’ of the trace wire – compressing, and subsequent slow releasing. This applied force is conversely expressed through the deflection – the bowing - of the wooden elements. The audience will also encounter a multiplicity of sonic resonance (pitch, tone, and length); the amplification of the vibrations within the wires and timber, as the work travels through a range of tensions in the kinetic cycle. Strain will be simultaneously alluring and repelling, through the interplay of beauty and threat, harmony and discordance – the Kantian sublime. Our practice is based on the propositional lens of re-articulating space, materiality, temporality and protracting moments in time, the interstice and the sensorial and corporeal experience of the viewer.